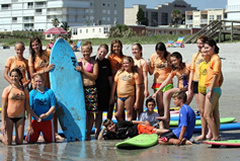 Our Surf School offers Surf Camps & Surfing Lessons in Cocoa Beach, Florida. 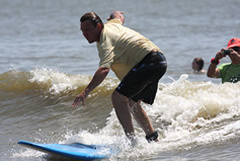 Our Surf School is now running surf camps and teaching surfing lessons in Cocoa Beach, Florida. From beginner to advanced, we have professional, CPR certified instructors which are there to ensure your fun and safety during the class. Cocoa Beach Florida is well known for surfing, and offers us an ideal location to run our surf camps and teach private surfing lessons. There is a variety of other surf camps being run in the county, some of which are at breaks that are not the best for giving surfing lessons. Cocoa Beach Florida has long been considered one of the best areas in the world to go in and catch your first waves. Whether you have never touched a surfboard before or ready to move to the Nex level, Nex Generation Surf School will take you there. Longboard or shortboard, we have the instructor for you! 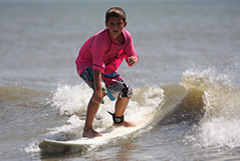 We will have you in the water and surfing on your very first day at camp or lesson. All of our surf camps have safe soft surfboards which make our camp as safe as it can get. For the more advanced surfers, you can supply your own boards if you wish to. No matter what, just make sure you get out there and have a good time.